The world is increasingly urban, interconnected, and changing. If current trends continue, by 2050 the global urban population is estimated to double and be around 6.5 billion. Most of future urban growth is expected to happen in small and medium-sized cities, not in megacities, and approximately 60% of the projected total urban area in 2030 has yet to be built. This represents unprecedented challenges for both halting biodiversity loss and creating sustainable global development, but also unprecedented opportunities. Many of the opportunities can be found in nature based solutions, using biodiversity and ecosystems in novel ways to address some of the most pressing challenges, such as climate change, water and food security. In particular, the way forward for cities involves reimagining cities as a places of biodiversity, and as sources for unique ecosystem services that have value to society, rather than only sinks that create large ecological footprints. There will be two books in the series. The first publication, CBO Action and Policy (A&P), will be launched in Hyderabad on October 15, 2012 at the Conference of the Parties 11th meeting. A&P has been developed in parallel with, and builds upon, the more detailed scientific assessment titled Global Urbanization, Biodiversity, and Ecosystems – Challenges and Opportunities, scheduled to be published in 2013. Both publications are a collaborative effort of the CBD and the Stockholm Resilience Centre of Stockholm University, with significant input from ICLEI – Local Governments for Sustainability. I present here a short summary and highlights. The whole study is available at www.cbd.int/authorities/cbo1.shtml. See alsoa video explaining the framework and background. 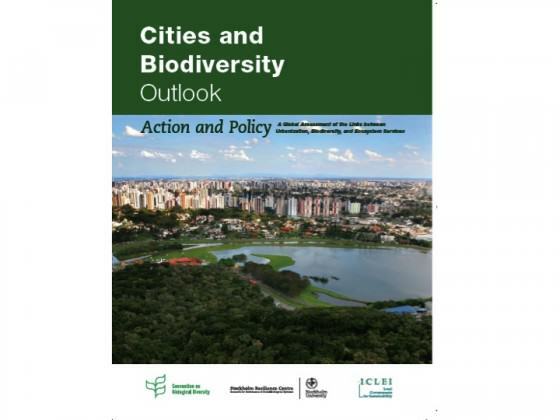 The cover of the first volume of the Cities and Biodiversity Outlook (CBO). Maintaining functioning urban ecosystems can significantly enhance human health and wellbeing. The total urban area is expected to increase two- to five-fold within the next two decades, while urban populations are expected to double. In other words, urban areas are expanding faster than urban populations and an urbanized area the size of South Africa is projected to be added by 2030. For examples see NASA’s Landsat program. This urban expansion will draw heavily on natural resources, including water, on a global scale, and will often consume prime agricultural land, with knock-on effects on biodiversity and ecosystem services elsewhere. 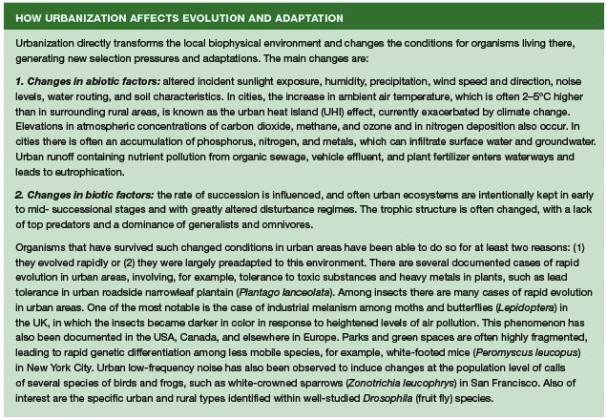 Urban expansion is occurring fast in areas adjacent to biodiversity hotspots and faster in low-elevation, biodiversity-rich coastal zones than in other areas. Most future urban expansion will occur in areas of low economic and human capacity, which will constrain the protection of biodiversity and management of ecosystem services. On the other hand, investing in green infrastructure may the only viable option for many cities in the developing world to address climate change challenges, food and water security and poverty. 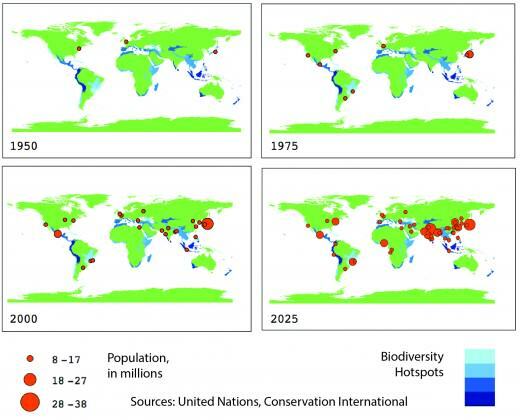 Global urbanization and biodiversity hotspots, 1950–2025. Some of the world’s fastest growing cities are near important centers of biodiversity. The CBO study highlights that many cities contain sites of special importance for conservation because they protect threatened species and habitats. Many are remnants of native vegetation that survived because their topography, soil, and other characteristics are unsuitable for residential, industrial or commercial development. Other sites remain protected because their ownership or their use and management have remained unchanged for decades (sometimes centuries), they are important sites of cultural heritage, or they have remained unused for a long time. Remarkable examples of such remnants include the forests of the Mata Atlantica in Rio de Janeiro, Brazil; the evergreen forests of the Botanical Garden in Singapore; remnants of natural forests in York, Canada, and in Portland, Oregon USA; Sonoran desert parks in Tucson and Phoenix, Arizona USA; the Ridge Forest in New Delhi and the semi-evergreen forest of Sanjay Gandhi National Park in Mumbai, India. Nevertheless, the conclusion based on recent studies summarized in CBO is that a remarkably high number of native species occur in cities. Studies across many taxonomic groups show that 50 percent or more of the regional or even national species assemblage is found in cities. For instance, more than 50 percent of the flora of Belgium can be found in Brussels, and 50 percent of vertebrates and 65 percent of birds in Poland occur in Warsaw. While some cosmopolitan urban species are indeed found worldwide, concerns about overall biotic homogenization may be somewhat unfounded. A recent global analysis of flora from 112 cities and avifauna from 54 cities found that on average two-thirds of plant species occurring in urban areas tend to be native to the region of each city; the proportion of native bird species is considerably higher (94 percent) than that of other native taxa. Clearly, many cities continue to retain a significant proportion of native biodiversity. Although some non-native species become invasive, dominating entire ecosystems and causing significant economic loss, other introduced species actually may replace functions of lost species and enhance specific ecosystem services in cities, such as soil mineralization, climate-change adaptation and mitigation, and cultural/aesthetic benefits. The opportunity (and challenge) lies in understanding what species will be favoured by the emerging urban areas, the roles they can play in the new ecosystems and thus what services they will support. There is an emphasis in CBO that urbanization provides multiple opportunities to ensure basic human welfare and a viable global environment. The opportunities are that urban landscapes are the very places where knowledge, innovations, and human and financial resources for developing nature based solutions to current and future challenges of sustainability are more likely to be found. One important challenge that could be successfully addressed by investments in nature-based solutions is climate change. For cities, climate change is manifested by rising sea level, higher temperatures causing heat waves, variation in precipitation, and more frequent and severe floods, droughts and storms. Despite the fact that the world is increasingly urban, the ways in which cities influence and are influenced by climate change have been considerably less explored than other areas of research on global warming. The situation is particularly alarming for Africa, where greater temperature increases than the global average are expected. This will have adverse effects on human wellbeing, particularly in cities, through dramatic changes in issues such as water availability, health, and sanitation. However, since more than 60 percent of the area projected to be urban in 2030 has yet to be built, this presents unprecedented opportunities to vastly improve the resilience of cities through designing systems for adaptation to climate change. By establishing new urban parks and increasing vegetation cover, cities may effectively reduce the urban heat island effect. Additional potential for lowering urban temperatures may be realized through construction of green roofs and green walls. Data from Manchester, UK, show that a 10 percent increase in tree canopy cover may result in a 3–4°C decrease in ambient temperature and save large amounts of energy used in cooling buildings (see further UK Ecosystem service assessment Urban chapter). In addition, there are other multiple benefits since urban green spaces can contribute to filtering dust, storing CO2, serving as windbreaks, etc. Vulnerability to climate-change effects may also be reduced through increased interception of rainfall by trees, other vegetation, and permeable soils in urban areas, reducing pressures on the drainage system and lowering the risk of surface-water flooding. Urban landscapes with 50–90 percent impervious ground cover can lose 40–83 percent of incoming rainfall to surface runoff, whereas forested landscapes lose only about 13 percent of rainfall input from similar precipitation events. Urban mangroves and other wetlands also serve as biofiltration systems for treatment of sewage, storm water, and other water-vectored wastes and help reduce downstream pollution. Biodiversity in cities exposes people to nature and thereby facilitates an appreciation of nature. It also provides opportunities for recreation, health and relaxation, and community cohesion and thus contributes to the resilience of societies. Green-area accessibility has been linked to reduced mortality and improved perceived and actual general health. It has been shown that the psychological benefits of green space increase with biodiversity, and that a “green view” from a window increases job satisfaction and reduces stress. This can have a strongly positive effect on economic productivity and hence regional prosperity. The distribution and accessibility of green space to different socioeconomic groups, however, often reveals large inequities in cities, contributing to inequity in both physical and mental health among socioeconomic groups. How to value urban ecosystem services? The development of more nature based solutions has been hampered so far by lack of methods and application of an economic valuation. 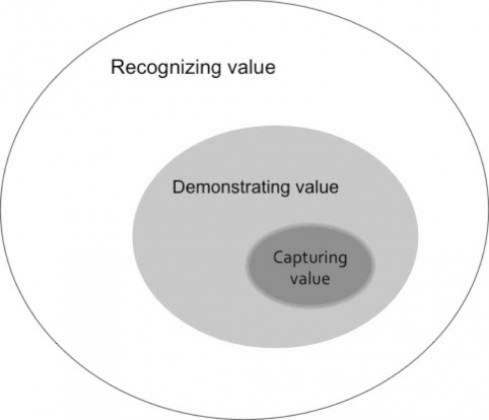 Many tools for monetary valuation of ecosystem services are already available, but these need to be complemented with non-monetary valuation methods and with planning tools based on multiple criteria. The total value of multiple services generated by ecosystems can be divided in different parts, as illustrated in the figure below, depending on whether there is a market and whether the value can be expressed in monetary or only in non-monetary terms. Ecosystem service science still lacks a robust theoretical framework that allows considering social and cultural values of urban ecosystems on an equal basis with monetary values in decision-making processes. Developing such a framework involves synthesizing the large but scattered body of literature that has dealt with non-monetary values of the environment, and articulating this research into ecosystem service concepts, methods, and classifications. 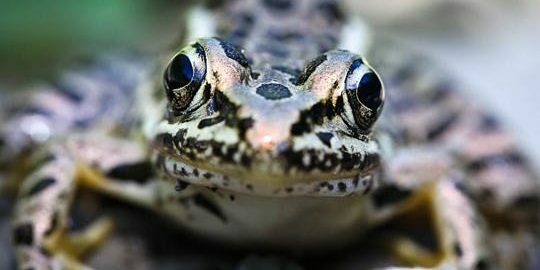 Since urbanization is fundamentally changing the nature of our planet, preserving biodiversity on this new urban world requires going well beyond the traditional conservation approaches of protecting and restoring what we think of as “natural ecosystems,” and trying to infuse or mimic such elements in the design of urban spaces. Cities already represent a new class of ecosystems shaped by the dynamic interactions between ecological and social systems. 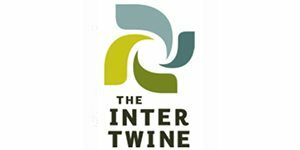 As we project the spread of these ecosystems across the globe, we must become more proactive in trying not only to preserve components of earlier ecosystems and services that they displace, but in imagining and building entirely new kinds of ecosystems that allow for a reconciliation between human development and biodiversity. While urbanization displaces many species, novel plant and animal communities have evolved in urban areas, often with active management by human society, and some of these now provide important services extending beyond urban boundaries. Residential gardens and parks, for example, have become important reservoirs for populations of bees and other pollinators, providing a diet more diverse than that from the countryside. Even some endangered species find suitable habitats in urban ecosystems when their original habitats have disappeared. Innovations such as rooftop gardens and vertical forests, and human interventions such as supplementary feeding and watering, have the potential to offer novel habitats and niches for species that may be quite different from those in more natural ecosystems. Finally, the implications of urban expansion are both local and global, as ecosystems do not follow municipal or national boundaries. The displaced ecological impact of increased urban consumption highlights the importance of moving away from narrow place-based solutions to more broadly addressing concerns on ecological degradation and urban biodiversity concerns. It is time to recognize the overarching impact of an increasingly urbanized world and to design appropriate governance responses. This is further discussed in an SRC video. There is a need for redefining the role of cities so that they increasingly become sources of ecosystem services rather than sinks and that they provide stewardship of marine, terrestrial and freshwater ecosystems elsewhere. 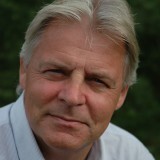 Developing the concept of nature based solutions entails not only relying on urban ecosystems to address challenges related to climate change, food and water security, but also to explore a deeper dimension of how attributes of ecosystems, such as diversity, modularity and redundancy may be interpreted, applied and used to build resilience in the urban landscape. 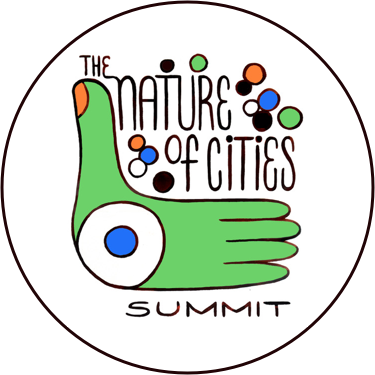 Every city is unique, with its own social and ecological prerequisites for development and evolution, and there are no global panaceas to urban biodiversity and ecosystem management, or to sustainability. However, there is much to be gained from questioning current trajectories and values while learning from others, producing better evidence and sharing information and experiences. No city can solve the current challenges alone. So amazing to know how the world will change. Great to know alot from you. Thank you. I enjoyed reading your post as it was very eye opening in regards to just how much the world will be changing over the next two decades. You continued to emphasize that 60 percent of the area that is to be urban in 2030 has yet to be built. It is important that people realize just how much land will be needed in order to support the ever growing population of the world. It is interesting that you said “many of the worlds cities are located in biodiversity-rich areas and this often has historical roots.” I say this because I am from a rapidly expanding city here in the U.S. in Georgia. We have two main rivers running through that converge into one large river. These have been used by the Native Americans and even during the Civil War. The historical value of these rivers and the biodiversity and ecosystems surrounding them are so important. However, that importance seems to get lost once construction on the new shopping center begins. In order to preserve and protect these ecosystems before they are destroyed, I agree that actions must be taken on the design and planning level. By addressing these issues before they become a problem, could save ecosystems and prevent the further loss of important native vegetation and wildlife. Are there any such planning guidelines or regulations in place in Sweden outside of say a nature preserve? As for the large cities, it is important that they continue to find ways to improve not only the quality of life for the people living in and around the area, but also ways that they can function as part of the ecosystem. If a city develops in an area that once played an important role in filtering storm water runoff before it entered a major body of water or continued on throughout the ecosystem, that they figured out ways in which the city or its systems could act as a filter without causing further harm; bio-mimicry. Yes, cities do have storm drainage systems but not to the extent that they haven’t caused further harm to ecosystems on a larger scale. It is important that the world as a whole becomes more aware of the importance and the dire need for change before the loss of the world’s precious ecosystems is too great to over come. There are many generations to come that deserve to enjoy the biodiversity of the world as it once was, not for what it has become. Thank you again for your post. It was very enjoyable and informative and needs to be something that more people are made aware of. Indeed it is! Really looking forward to seeing it next week in Hyderabad. So great to see this coming to fruition! Congratulations.